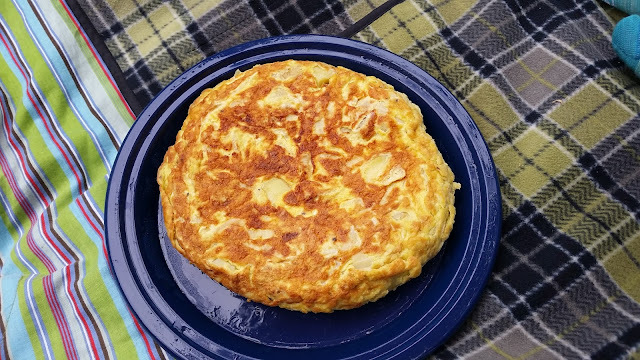 AKA Tortilla de Patatas in Spain, or Tortilla de Papas in Argentina, where Mexican tortillas have arrived but are called fajitas. Language is fascinating in its ability to clarify or confuse! I learned how to make them when my college roommate's Basque mom visited. It took a few tries to get the technique down, but since then, this dish has become a potluck staple. Almost everyone can eat it, and almost everyone loves it! This photo is from this weekend's picnic. 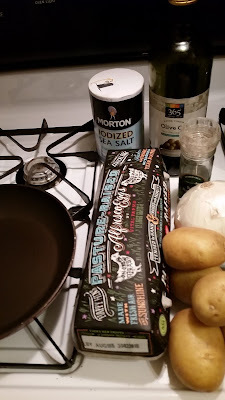 I've never followed a standard-issue recipe and I think it's one of those traditional dishes that can be made without one (with a little practice), so I'll just share the steps as I do them. 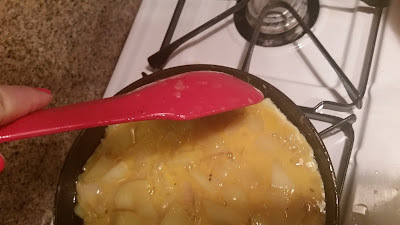 The nonstick pan is pretty important, unless you have an extremely well-seasoned cast iron pan and the arm strength to pick it up and flip it over with one hand. This is my "is this nonstick pan finished" test recipe, actually. How much you need of each will depend on the size of your pan. I'm using an 8 inch here because the light weight serving plate I need to use is 10 inches and my other option is a 12 inch pan. It made about 8 servings as part of brunch, and could have been cut smaller for a cocktail party. You can use another type of oil, but I don't recommend it. You don't have to spend a ton of money, though...a store brand will work just fine. You can also use any kind of eggs, but if you splurge on the good ones, you will really notice a difference. 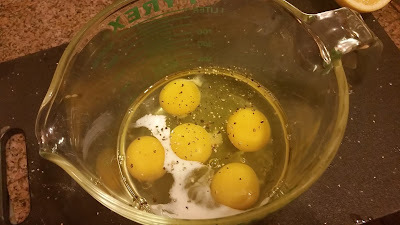 If you don't have a farmers' market nearby or you can't get to one regularly, look for pastured eggs. 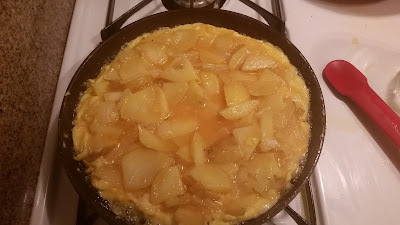 As for the potatoes, my original teacher used Russets. They can get a little mushy in the poaching, though, so some prefer to use waxier red potatoes. I've been using gold potatoes for a while. They're tasty and the skins are delicate, so you just have to cut off the funky bits instead of peeling them completely. Cut the potatoes into pieces of more or less even size. Cut enough pieces to almost fill your pan, then transfer to a bowl and add some diced white or yellow onion. I used about a third of the giant one pictured, not all of it! 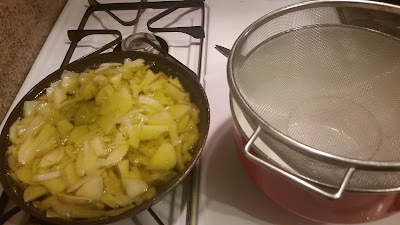 Toss the potatoes and onions with salt. Start with 3/4 tsp - you can add more with the eggs later if you need it. 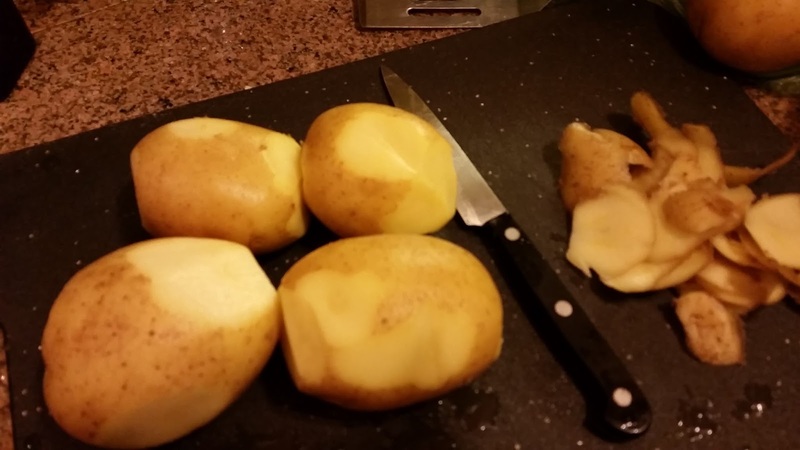 I know some people avoid salt, but potatoes really need it. Use less if you want, but don't skip it altogether! 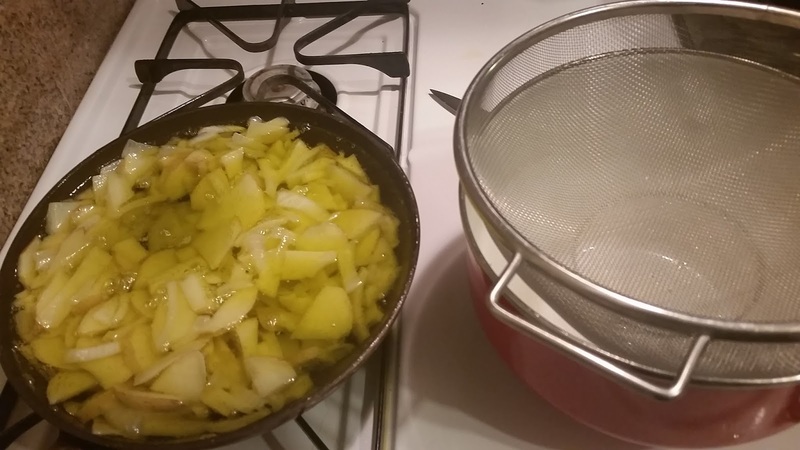 Put the potatoes and onions back in the pan and cover with olive oil. 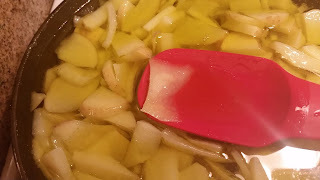 Bring the oil to a gentle simmer over medium low heat and poach the potato-onion mixture until just cooked through, stirring very gently to prevent any browning on the bottom, 10-15 minutes. Start checking for doneness when you see some pieces becoming translucent like this one. Drain the potatoes. Keep the now-flavored oil and saute your next batch of scrambled eggs or breakfast potatoes in some of it. You're welcome. Taste the potato mix for salt. If it needs more, add a little to the egg mixture. If not, skip the salt in the egg step. While the potatoes cool a little bit, crack some eggs into a bowl. 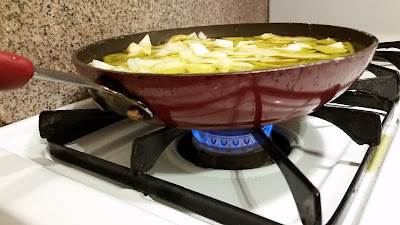 Five is the perfect number for this size pan, but you might need more for a bigger pan. Add in some black pepper and a splash of milk or cream, then beat well. Beat the eggs. 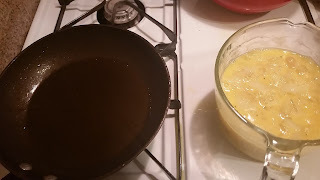 Add the potato mixture to the egg mixture and stir. Put a little of the oil back into the pan over medium heat. Pour the eggs and potatoes into the pan. The edges will start to set up quickly. Use a silicone or wooden spoon to gently pull them back and let more of the egg mixture spill over those edges. This helps keep them from sticking and cooks everything gently. Turn the heat down just a hair and let everything cook for a few minutes. When it looks like it's at least half cooked through, it's time to flip it. I usually look for it to bubble a little at the center, but that didn't happen this time. Instead, I turned it when it looked like this and I started to smell "done" eggs. Here comes the scary part! 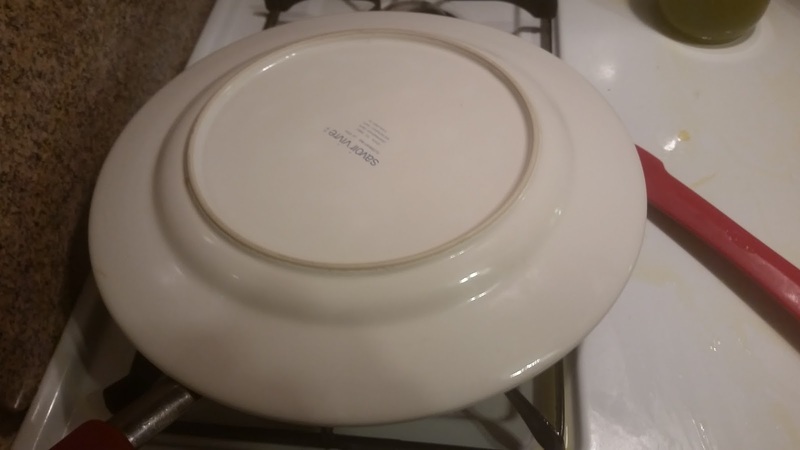 Find a plate that's at least two inches bigger in diameter than your pan. Place it over the pan and turn off the heat. Using pot holders or oven mitts, put one hand on top of the plate and one hand on the handle. Take a deep breath! 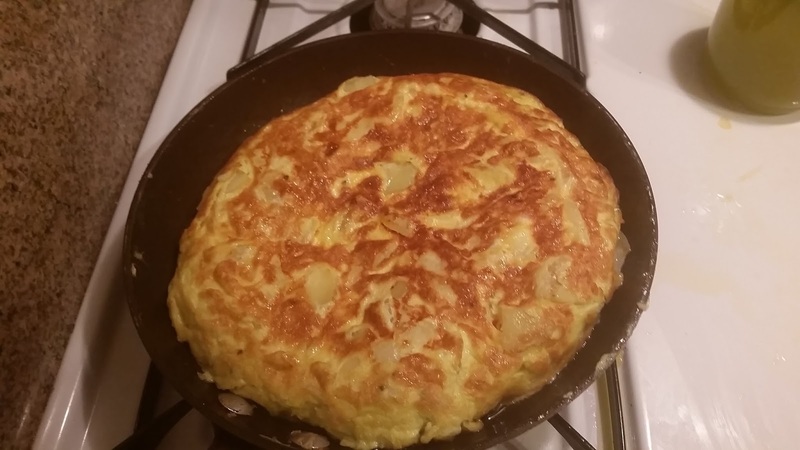 Flip the tortilla onto the plate and then gently slide it back into the pan. You can use an upside down baking sheet if you don't have the right size pan. Turn the burner on again (to medium heat) and let cook for about five more minutes. Turn off and leave in the pan to cool and finish cooking from the residual heat for a few more minutes before serving. Slide onto a serving plate and serve as is or with some garlicky aioli. I slid it onto a sturdy plastic plate, then topped it with another plate and wrapped it well to take it to the picnic. It made it in one piece! If serving for a small crowd, slice it like a pie. If you're sharing with a big crowd, cut it into squares.